This debate has been ongoing for many years and until now I have never seen an adequate reasoning! 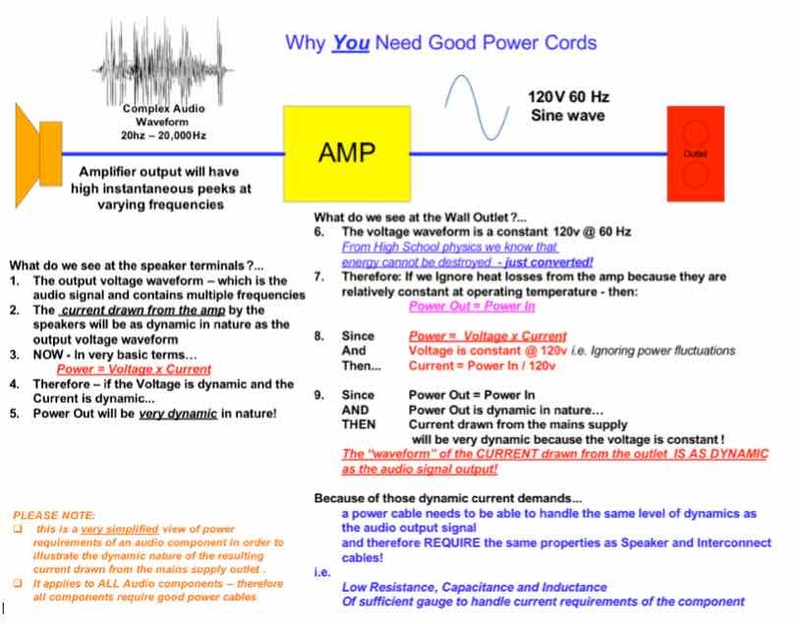 So what happens inside the amp if the dynamic current peaks cannot be accommodated? the voltage within the circuit will fluctuate ever so slightly. the fluctuations can result in distortions being introduced into the amplified signal. also, remember there are two amplifiers operating in a stereo system, so the fluctuations will not be exactly the same. this can result is subtle changes to the phase of the two signals of the LR channels. changes in phase tend to alter the stereo image such that the image becomes "smeared" or "unfocused”. Therefore peaks in current demand are accommodated by their ability to supply the required current from the power supply directly and when that is exhausted, from the main supply. If there is a tiny little power cord attached to the amp then the “effective supply, i.e. as seen by the power supply of the amp, is unable provide the required current in time. The stereo image and dynamic response will not be as good as what is actually achievable. Most hi-end stereo equipment is designed with sufficient "headroom" in the power supply, but the power cord may be insufficient to deal with the peak transient demands that the internal circuitry and components are capable of. More modestly priced components tend to skimp a little on the components in their power supply because they are designed to a “price point”. In either case — having quality power cabling, connectors , etc., will allow all audio components to perform to a significantly higher level. What can you do to ensure the equipment is working to it's fullest abilities? I have a 20 amp hospital grade MRI outlet from Take Five Audio - it has much stronger clamping abilities. Even a 15 amp hospital grade outlet will be better than a standard outlet. Ensure that all mains leads are of sufficient gauge and made from high quality copper. 10 gauge minimum for amps. Even larger for those very big mono-block amps or very high powered amps (say, 1000 watts and up). 12-15 gauge minimum for source components . Ensure that all plugs are of a reasonable quality — again you don't have to go nuts. SONAR QUEST CRYO Ag Audio Grade Silver plated connectors are very good and reasonably priced. For added safety/security I crimp spade connectors to the conductors. This ensures maximum electrical contact and the wire should remain securely attached. The same applies to TV's also — the better the cord the better the image! So why doesn't the manufacturer provide good power cords? All amps are designed to a "price point”. the manufacturer knows that if they include a good cord it will up their price compared to the competition. they also know that the informed consumer will buy a better cord anyway. NAIM did have a slightly better cord included, but it falls very short from the cables that really makes it "shine”. There’s all sorts of noise on transmission lines. Add to that the noise in old transformers on hydro poles and all those poor connections. The crappy quality wire in the walls of your house/apartment doesn’t help. and don’t forget all those noisy household appliances. A mistake often made is equating the flow of electrical current to the flow of water through a hose, which is not the case. AC stands for Alternating Current but, in reality it’s alternating voltage — the voltage is a sine wave that cycles to +120v and -120v either side of a zero voltage point at 50/60 cycles a second. YES! - YOUR power cables! So, if you can clean up this section, the power coming to the components will be clean and allow them to perform to the best of their abilities. What causes all this noise? Primarily - poor power cable design! How can you clean up the last 5ft? Well, as stated above — the wires have to be adjacent and parallel for induction to take effect. You could just separate them by about one inch, but that’s not really a convenient solution. But one very simple method is to braid the conductors — the tighter the braid the better they perform. In a braid, the wires cross each other at an angle between 30-50 degrees . This is enough to reduce the effect of the induction process. resulting in a significant reduction in noise. There is virtually no noise induced into the neutral or ground conductors. The neutral and ground conductors also interrupt RFI/EMI pollution of the Live conductor. The resulting power is virtually clean. But, this “winding process” is much more complex to implement. And more than doubles the amount of wire required. Probably the main reason why it is seldom used. Typically, for a Ft 5 power cord I would use 12-14 Ft of wire for each of the neutral and ground conductors. There is one upside — the wire used for the Neutral and Ground wires does not have to be of the same high quality as the wire for the Live Conductor. using a stiffer wire allows it to “hold” the helix shape once it has been formed and it does not have to be of the same high quality copper as the Live Conductor. You can then insert a high quality, more flexible “live” conductor, like those available from Furutech or DH Labs, into the helix to complete the three conductors required for mains cables. The higher purity copper used in the live conductor will provide a much faster response to transient demands, i.e., better dynamic response. an easy approach is to wind the conductors around a wooden dowel. the resulting helix is like a spring and quite flexible. See DIY Power Cables - The “POWER HELIX"
Of all of the power cable architectures I have tried to date, I have found the helix architecture to provide the most detailed and dynamic performance. Ensure the cable is rated for mains use - I use cable capable of handling >=600v at 200 celsius . the gauge you select must be able to carry the power required by the component. DO NOT use Romex House Wire for prolonged use — it will crack and fail with use. Ensure you get the polarity correct when connecting the MAINS/IEC plugs. Reversing the polarity could result in degraded performance. It can also result in electrical shock. For added security I always crimp small plated copper spades on the ends of each wire and then fasten those into the mains connectors. They are about the safest method, other than soldering, of ensuring the wires will not pull out. The other benefit is that they appear to assist in the transmission process — the net result being improved dynamic performance. Most of my cables are between 4 and Ft 6 long. I have one helix cable that is only 3ft long and it works extremely well. Failure to connect plugs using the correct polarity can result in electric shock resulting in death or may cause equipment to malfunction, resulting in fire! If you have not had adequate training in the maintenance of electrical appliances, mains electricity or power electrical theories - DO NOT attempt to maintain or build power related products! IF YOU ATTEMPT TO BUILD POWER CABLES YOU DO SO AT YOUR OWN RISK! YOU ARE RESPONSIBLE FOR YOUR COMPETENCE IN CABLE ASSEMBLY PROCEDURES! YOU ARE RESPONSIBLE FOR YOUR MATERIALS CHOICE! YOU ARE RESPONSIBLE FOR YOUR INTERPRETATION OF INFORMATION ON THIS BLOG!